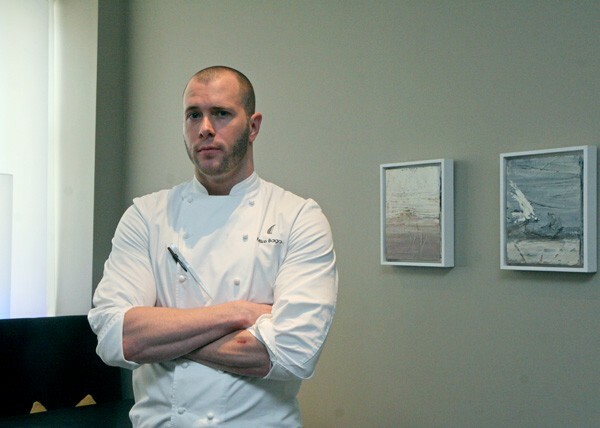 Mike Bagale, chef de cuisine at Alinea, had never tried Necco Wafers before Andrew Brochu of the Aviary challenged him to make a dish with them. And once he'd tasted them, he wasn't impressed. "It tastes like chalk," he said. "They're rock hard. I almost broke my tooth biting into it. . . . It's a nightmare to eat." "Who actually buys this and consumes it?" Bagale asked. "It's amazing that there's a market for it." Necco Wafers are a candy that's been made since 1847; during the Civil War, Union soldiers would carry the wafers with them. Sales peaked during World War II after the U.S. government ordered the New England Confectionery Company (Necco) to produce the wafers for soldiers overseas. 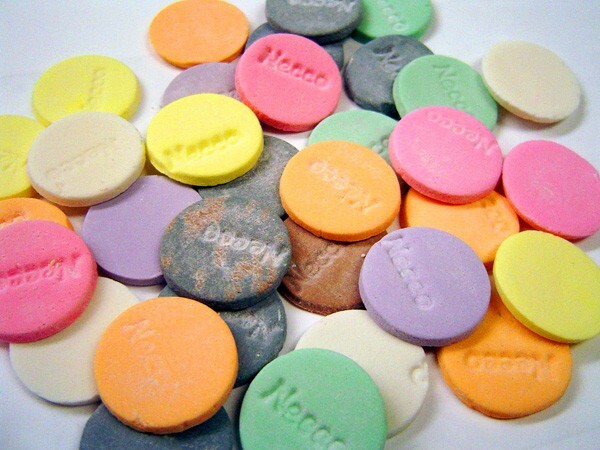 In 2009, Necco changed its formula to eliminate artificial colors and flavors and introduced glycerine to soften the wafers. Unfortunately for Bagale, loyal customers hated the change, and in 2011 Necco switched back to the original formula. "I grew up with Skittles and Starburst and Twizzlers, and this thing's nothing like that," Bagale said. "These were great flavors in 1847. We've moved on from that." Bagale said he knew immediately that he would make a dessert with the wafers, because trying to pair them with a protein "would be absolutely disgusting." He started by boiling some with water and sugar—essentially candying candy—to "tenderize" them. For another application he picked out a few flavors from Necco's tropical line, blended them with hot water, sugar, and glucose, then emulsified them with a little oil to make Necco paints. A coconut pudding included coconut water and powdered coconut-flavored wafers. "It's candy on top of candy on sugar on top of sugar on top of sugar," he said. And the poor guy doesn't even have a sweet tooth. He also made cotton candy with watermelon-flavored wafers, which he sprinkled with powdered Necco Wafers, and licorice-flavored wafers cooked down with molasses into a syrup. "Molasses goes well with tropical fruits and licorice root," Bagale said. "This is going to be perfect for an eight-year-old. It's going to be enough sugar to rot all your teeth out." A few elements of the dish didn't involve Necco Wafers at all. "I needed to add some sort of fresh fruit to it. Something that actually tasted good," Bagale said. 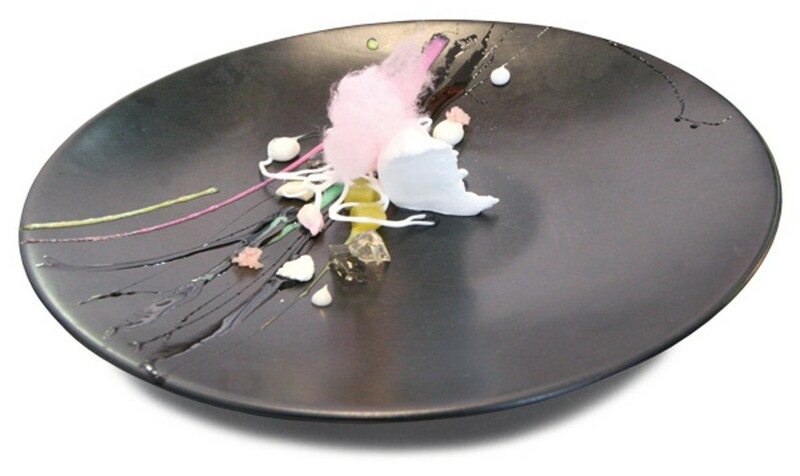 So he threw in compressed pineapple, and added finger lime and a sorbet made with cherry blossom tea for acidity; the tea also went into his pâtes de fruits, fruit jellies. 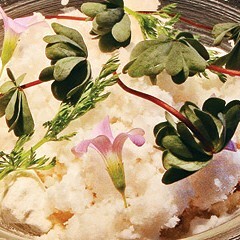 Banana nectar—piped into a container of liquid nitrogen to make interesting shapes—and creme fraiche finished the dish. "I'm a little scared, because I don't like candy," Bagale said before he tasted his creation. After sampling it, he commented, "It's kind of how I knew it was going to be—way too sweet for me. But I do get that Necco flavor. I definitely taste it in the sauce and the powder." "A little kid would love it," he added. "It's not for the average diner. " 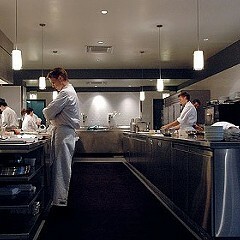 Jeff Mahin of Stella Barra Pizzeria and Summer House Santa Monica, challenged to make a dish with okra. "It's a tough ingredient," Bagale said. "You can fry it and maybe make a sauce with it, but that's not too creative." "Sugar on top of sugar on top of sugar"
Boil sugar and water to soft crack stage, stir in Necco Wafers, stir until crystallized. Pour out on a silicone mat to cool. Add all ingredients to a pot, place over heat and reduce to a syrup. Macerate and compress. Steep for 24 hours. Strain through cheesecloth. 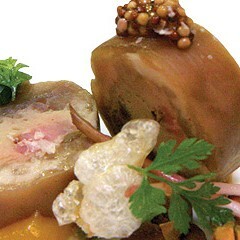 Challenged to cook with trotters, the Next sous chef stuffs them with white pudding.